Holland ´44 is a two-player game depicting the Allies’ combined ground and airborne attack in the Netherlands during WWII, which was code named Operation Market-Garden. 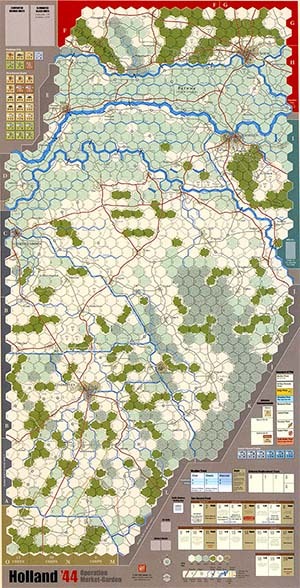 Holland ´44 uses a system very similar to Ardennes ‘44. It is basically a simple move-fight, I-go then u-go game. If you have played Ardennes ‘44 or Normandy ‘44 you will have no trouble learning the game. Rules such as ZOC Bonds, Determined Defense, Extended Movement, and Traffic Markers all make their reappearance. Due to the terrain of the Netherlands, special attention was given to river crossings, bridge building, and fighting in the flat polder terrain.